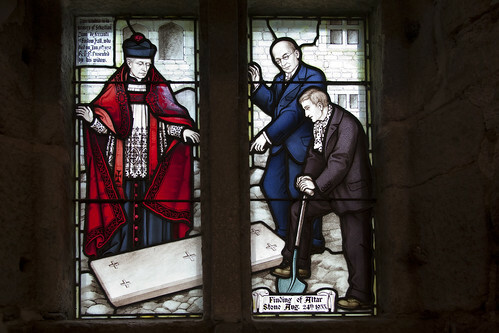 Evelyn Waugh, the foremost Catholic writer of his day, Sir Arnold Lunn, controversialist and skiing pioneer, and Hugh Ross Williamson, media personality and historian: quite a trio of founding fathers! All them, interestingly, were converts. Until his death in 1966, Waugh acted as an unofficial spokesman for the conservatives, expressing their growing disenchantment to Cardinal Heenan and in the press. 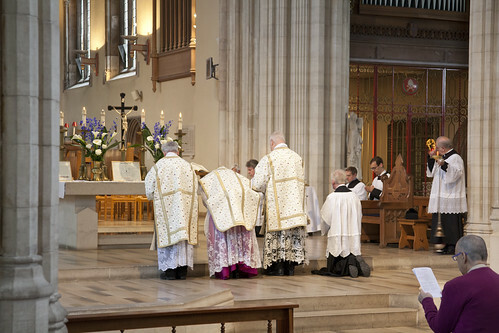 He was also instrumental, with Sir Arnold Lunn and Hugh Ross Williamson, in founding the Latin Mass Society in Easter 1965. 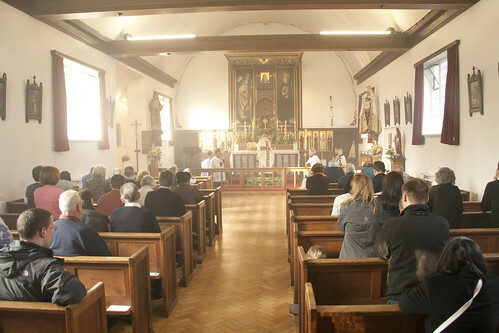 Almost from its inception, the Society attracted significant support and was soon organising itself at a diocesan level. 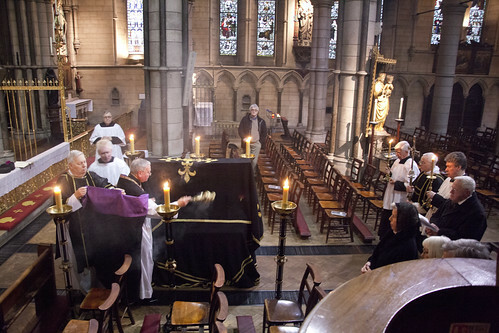 Most importantly it brought like-minded laymen and sympathetic clergy into contact. 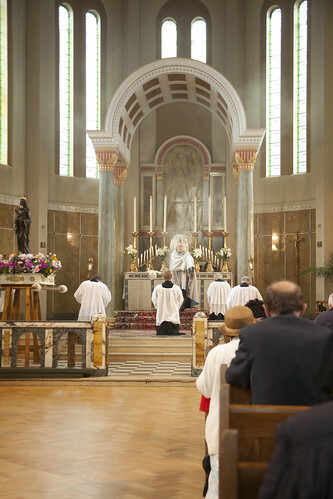 Before the introduction of the Novus Ordo in 1969, its objectives were clear and completely in accord with the wording of the Second Vatican Council’s Decree on the Liturgy and the Encyclical Letter of 1962, ‘Veterum Sapientiae’ both of which urged the retention of the Latin language in the rites of the Church. Despite this, the Society was largely ignored by the English hierarchy and sometimes treated with downright hostility, a fact which gave rise, in some minds, to a suspicion that even more radical developments were in store. 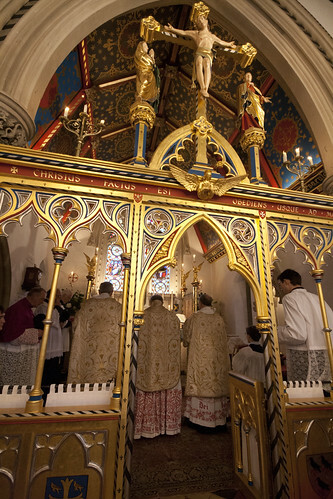 The Latin Mass Society developed into a ‘broad church’ organisation containingwithin its ranks a range of differing opinions including those who considered the very identityof the Church to be imperilled and those who preferred the Latin liturgy for cultural reasons. I suspect that most members oscillated between the two opinions. Its Annual General Meetings were rather colourful and sometimes noisy occasions at which the clash of contending views was distinctly audible. 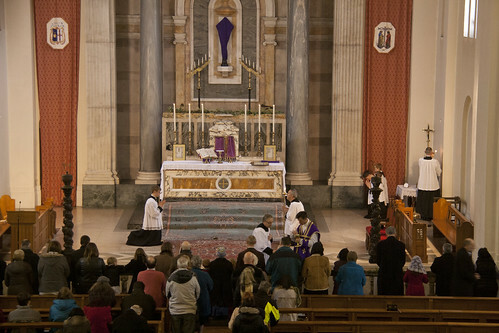 With the promulgation of the Missa Normativa came the biggest clash of all. There were those within the Society who felt bound in conscience to accept the new rite, while others favoured carrying on the fight for the old. At the AGM of 1969 there were impassioned speeches on both sides. 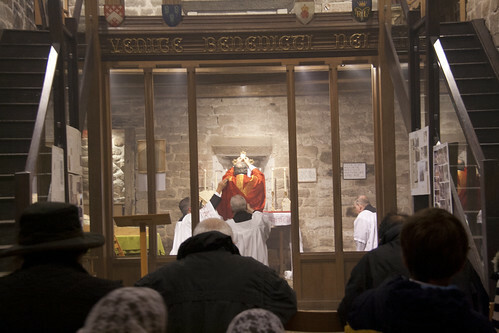 Hugh Ross Williamson put the case for the ancient rite, citing the privilege contained in St Pius V’s Bull ‘Quo Primum Tempore’, the famous Ottaviani Intervention and the doctrinal dubiety of the Novus Ordo. Dr R. H. Richens argued for accepting the new rite pointing out the danger of schism implicit in the alternative course of action. By an overwhelming majority, the members voted in favour of the Ross Williamson motion - a decision which was described as ‘Latin Madness’, the banner headline in the following week’s Universe. 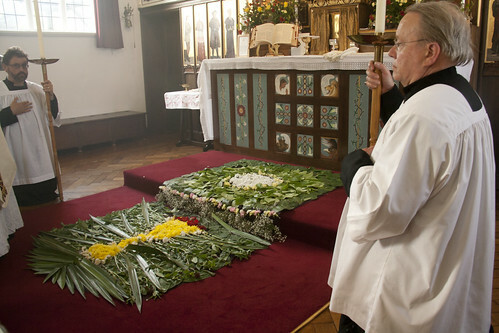 The LMS was affiliated to the international federation, Una Voce, which also decided to carry on the struggle for the traditional rite. 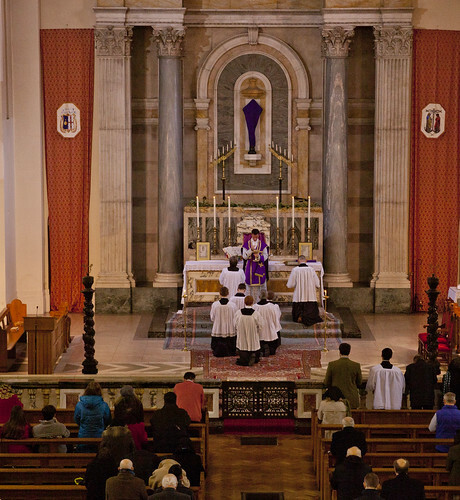 The patient advocacy of the Latin Mass Society yielded its first fruit in the form of an Indult granted by the Sacred Congregation of Divine Worship to Cardinal Heenan on 5 November 1971. The Indult was highly restricted in a number of respects. 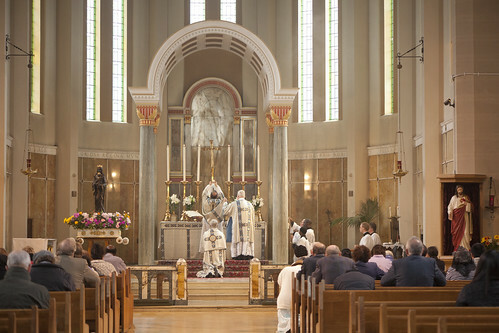 It permitted local ordinaries in England and Wales to grant permission to groups of people to participate at Mass celebrated ‘according to the rites and texts of the former Roman Missal (27 January 1965) with the modification indicated in the ‘Instructio Altera’ (4 May 1967).’ In other words, the very mutilated rite as it existed on the eve of the Novus Ordo could, on rare occasions, be said with the express permission of the diocesan bishop. In practice, this grudging concession made little difference, though some cherished its symbolic value as the first breach in the wall of hierarchical intransigence. 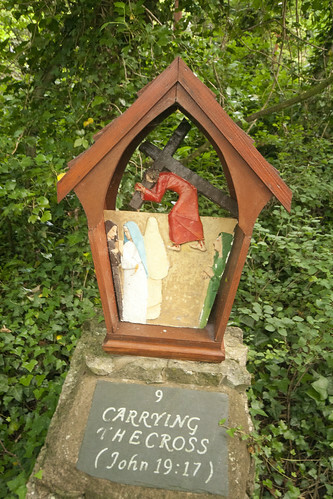 The pilgrimage honours two martyr-priests of Penal times, both beatified: Bl Nicholas Garlick and Bl Robert Ludlam. 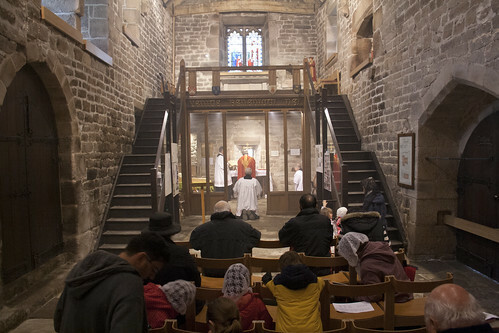 The chapel was in the upper floor of the gatehouse of Padley Manor, the home of the Fitzherbert family, who were Catholics. 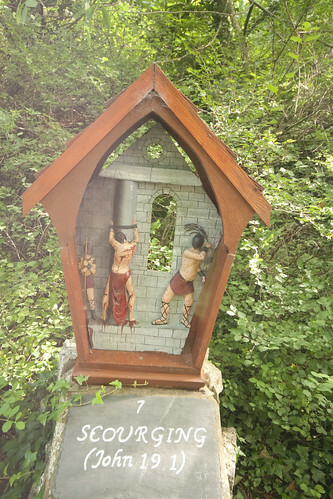 It came back into Catholic hands, and was restored as a chapel and shrine in 1933. 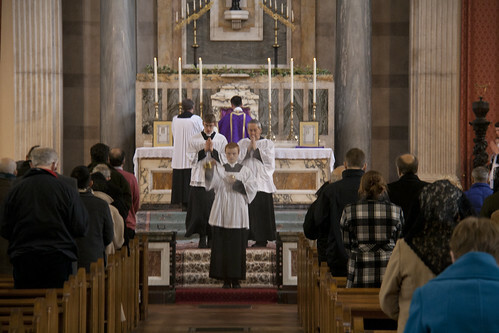 Missa Cantata was celebrated by Fr Martin Clayton, a long-standing friend of the Traditional Mass and the LMS in this part of the country. I fancy it was a bit off the beaten track in the 16th century; to get there today, you have to walk half a mile from Grindleford station. I think that's rather cool. It is a real pilgrimage. 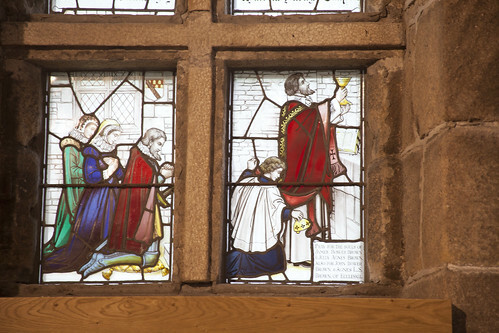 The two priests were captured in the chapel, and soon afterwards martyred in Derby; the manor was seized also, and is now a ruin; only the gatehouse survived, where the chapel had been. 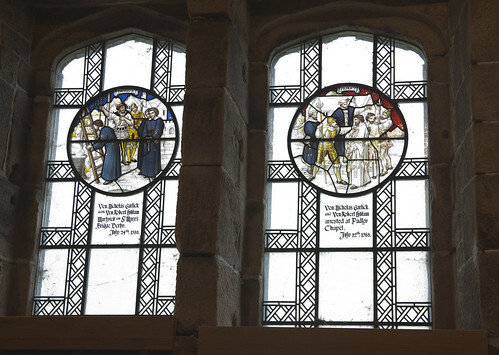 The story of the martyrs is told in Padley Chapel's stained glass windows, as is the rather amazing discovery in 1934 of the original chapel's altar. The chapel had, of course, been dismantled by its new Protestant owners, who included the notorious priest-hunter and torturer Topcliffe. 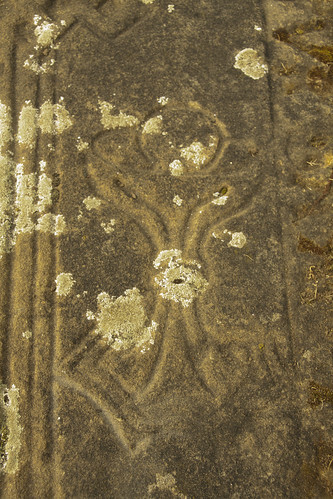 At some point the altar stone - not just a miniature square one for insertion into a wooden altar, but a great slab - was buried in part of the manor. 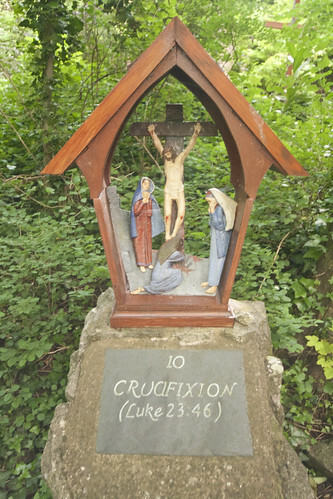 It was discovered, unmistakable with its five crosses, and restored to its place in the chapel. 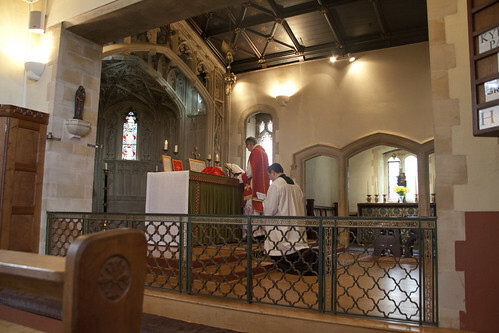 The original site of the chapel on the upper floor is where the historic altar has been restored; the floor has mostly been cut away, however, and it is possible for Mass to be said up aloft, or on the ground floor. 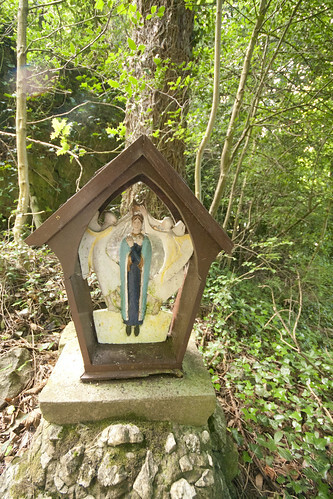 It can also be said under a special shelter in the ruined manor house, when there are too many pilgrims to fit into the chapel. We didn't only honour the martyrs with a lovely Sung Mass, but by hanging around in the drizzle while the key to the chapel had to be fetched (some wires had got crossed, these things happen). A minor penance which gave an edge not only to Mass, but to a rather splendid tea we had just down the road afterwards. 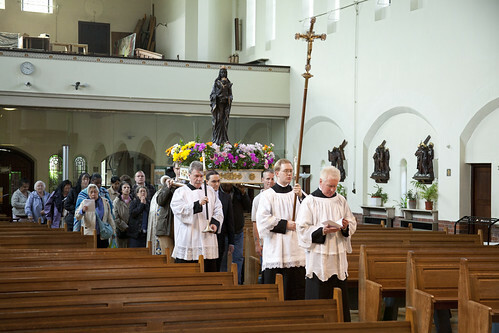 In reviewing the work of Mgr Basil Loftus - or, as he now prefers to be known, Mgr Basil Loftus - it would be wrong to neglect his views on the Resurrection. For among all the strange things he has written, these are perhaps the most striking. He writes about it most Easters, and I have before me his articles for April 8th 2010, April 17th 2011, and April 11th 2012. He preferred to cover other topics in 2013. Perhaps that was wise. What we have today in the New Testament is a combination of three elements: historical facts, early teaching, and oral tradition. 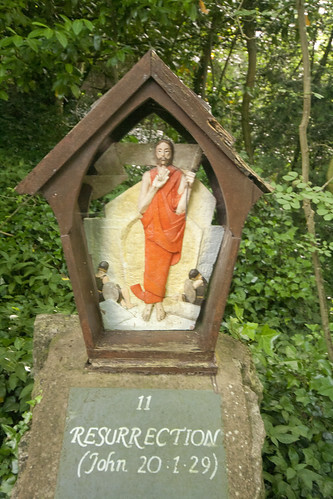 What about the innerancy of Scripture, reaffirmed by the Second Vatican Council? Loftus neglects to mention this. There is also the simple fact that we don't have it as an historical fact that Christ rose on the 'third day'. We only know that he had risen by then, because that is when the tomb was found to be empty. So the fact that Christ rose on the third day, which we find in numerous passages of scripture (eg Acts 10:40), isn't a fact? Luke in his gospel has Christ ascending to Heaven on the same day that he rose from the dead (chapter 24), while the same author, writing in the Acts of the Apostles, has the Ascension taking place 40 days after the Resurrection (chapter 1). No: Luke 24 says no such thing, though the events are presented in a telescoped fashion. It is hardly credible that Luke would contradict himself, and the more detailed account in Acts disambiguates the brief summary in the Gospel. But Mgr Loftus seems rather keener on the two events happening, not just on the same day, but more or less indistinguishably. For the rest of the article he talks about 'Christ's Resurrection/Ascension event'. the Resurrection glorifies Jesus. ...Effectively, Jesus has been enthroned in Heaven. It has been contaminated, for instance, by differing details such as who went to the tomb. Here Loftus makes the bizarre claim that the New Testament does not attest to the Resurrection as a historical event. Clearer, now? So when Acts 10:40 reports St Peter saying that Jesus rose from the dead after three days, when Matthew 28:6 reports that the Angel said that 'He is risen' to the women, when St Paul tells us on various occasions that Jesus rose from the dead, we cannot infer 'historically' that this took place, for these are reports of witness to the Resurrection. But how is this different from the witness to the empty tomb, which the Evangelists give us? Loftus hasn't really thought this one through. Each of the four Gospels is simply what the Evangelist, in each case, is telling us: it is witness. 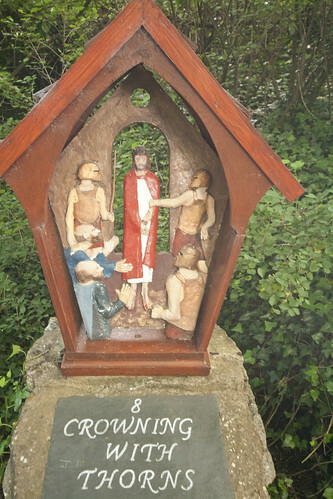 But it seems Loftus is more comfortable accepting the witness to some historical facts - like the empty tomb - than to others - like the physical resurrection of Our Lord. I can't tell if he blushed when he wrote what came next, but Loftus actually quotes the notorious Dutch Catechism on the subject. The way that the resurrection, as such, happened is hidden from all human sight and outside all scientific verification. This is the document deemed so defective by the Vatican that the Dutch bishops were obliged to add 50 pages of clarifications to it (though they never fully complied with the demand for corrections). For our purposes, what about the scientific verification of St Thomas the Apostle, who wanted, and was able, to put his fingers into the wounds? The meaning of Christ's resurrection is not the reanimation of a corpse. ...It is rather that the Son of God, made man, through his death on the cross, came to be exalted as the right hand of the Father in his historical-bodily being. Well, I can tell you that, after reciting the Nicene Creed all my life, I'll be mightily disappointed if my corpse is not reanimated. Now we have a little clarification. 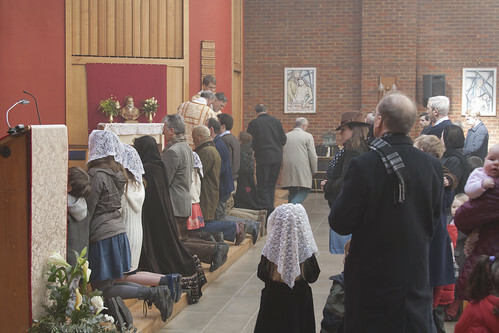 And so out comes the usual misleading use of St Paul's term 'spiritual body' (1 Cor. 15:44). Why didn't Loftus think of this before? It is a perfect way to insinuate that the Resurrection was not a physical, historical event, but something mystical and spiritual. But only if you - yet again - ignore all the stuff in the Gospels about the physicality of the Risen Lord, touching Him, His eating. So that is what Loftus does. 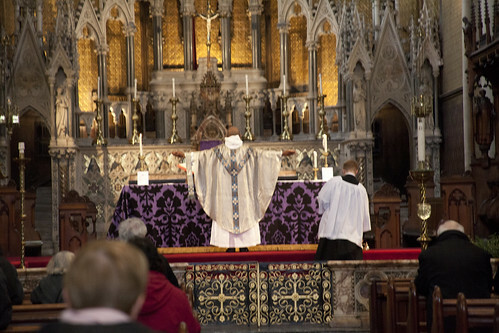 What would it cost Mgr Loftus to reassure his readers that Christ rose from the dead physically, and that although His body was glorified, it was still a physical body, tangible, able to eat, present in one place in a sense that it was not present in another? It would cost him nothing. But he refuses to say it. It is pretty clear that he has a problem with this aspect of the Church's teaching. Whatever orthodox spin he might put on his words if challenged does not change the effect that they must have on the mostly unsophisticated readers of the Catholic Times. The fact that he is allowed to set out his confused and misleading screeds in a Catholic newspaper year after year is a scandal. 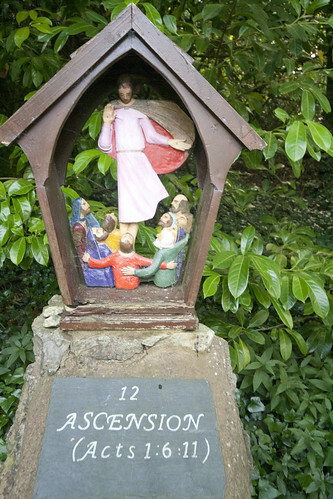 Photos: The Glorious Mysteries of the Rosary, at the Fransiscan Retreat Centre at Pantasaph. More here. Something has to be done to challenge those cardinals, bishops and priests who simply don’t get it. Is an appeal for £500,000 for work on Archbishop’s House, Westminster, and the some £1 million reportedly spent recently on the nunciature, compatible with the example Francis wants to “send ... to other cardinals, bishops and priests” when he lives in a clergy hostel? Are Eminences, Graces, Lordships and Monsignori admissible as titles, when Francis has renounced virtually every title except Bishop of Rome? 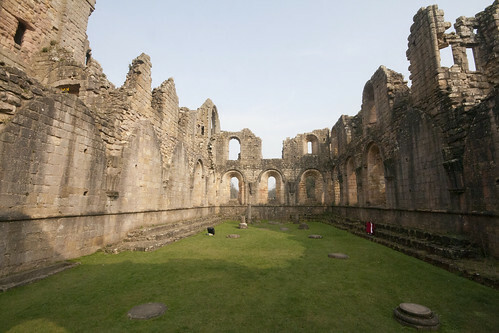 The Chapter House of Fountains Abbey, Yorkshire: Loftus would like to see the residence of the Archbishops of Westminster more like this. How should we address Monsignor Basil Loftus henceforth? Fr Loftus? Mr Loftus? Sirrah? Maybe just 'Oi you!'. Out of respect for his exalted rank as a Minor Prelate, I will of course from now on, in accord with his expressed preferences, stop referring to him as 'Monsignor'. I'll stick to the nobly simple, unadorned surname: Loftus. He's on fine form this weekend, attacking Bishop Mark Davies, the Nuncio, and Archbishop Nichols in The Tablet, and attacking Bishop Egan in the Catholic Times. I suppose, for the Nuncio and Archbishop Nichols, he thinks they should let their historic residences fall into ruins around their ears, contrary to their obligations as custodians of listed buildings. The crimes of Bishop Davis and Bishop Egan are more ideological. [T]the Christian simplicity we see in Pope Francis leads us, not towards abandoning the demands of the Catholic faith, as some commentators might hope or suppose, but directly to those demands in their most radical, beautiful and uncompromising essence. 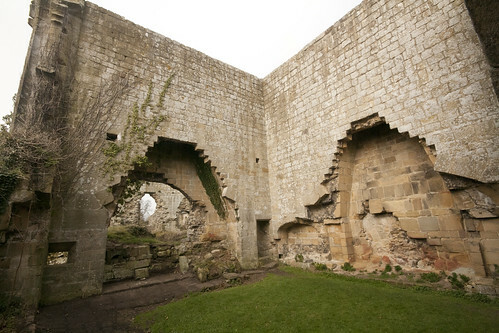 Kitchens at Jervaulx Abbey, Yorkshire. Not much soup for the poor gets cooked here these days. Those shoes! They are going to lead us to the promised land of dogma-free religion, are they, Basil? 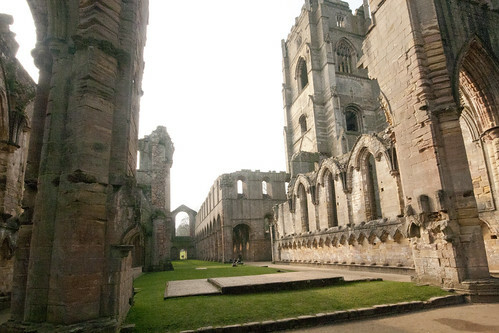 Fountains Abbey Church, from the East end. How Loftus would like all our churches to look, perhaps. What's the point here? Loftus' presentation of the quotations suggests that Pope Francis is condemning an attitude of Bishop Egan, and even of Pope Benedict. That is both deeply uncharitably and deeply dishonest. Clearly the kind of security Bishop Egan is talking about is not the kind of security Pope Francis is setting aside. A moment's reflection on the Pontificate of Pope Benedict does not suggest that he was someone who played it safe, who didn't step outside the comfort zone of the people around him when he thought that doing so was an evangelical imperative. (Regensburg? 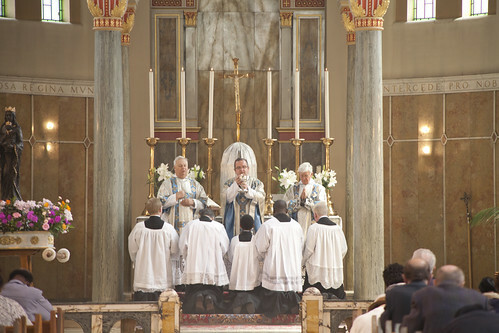 Summorum Pontificum? Anglicanorum coetibus?) As for Bishop Egan, he was writing during the period of Sede Vacante, and his column on the qualities needed by a new Pope was well summarised by the Tablet's headline: 'Combine the energetic creativity of John Paul with the prayerful fidelity of Benedict'. Theologically, no progress was being made at all. The lectures I attended at Rome's Gregorian University in the 1950s in no way differed from those given four centuries earlier. Really? So they neglected to tell the young Loftus about the condemnation of Jansenism in the 17th century, and the clarification of the theology of grace that entailed? They neglected to tell him about the theology of Church and State developed and promulgated by the great Popes of the 19th century? They didn't tell him about Leo XIII's Social Teaching? They didn't mention the development of devotion to the Sacred Heart, and its theological implications, which swept through the Church in the 19th century? 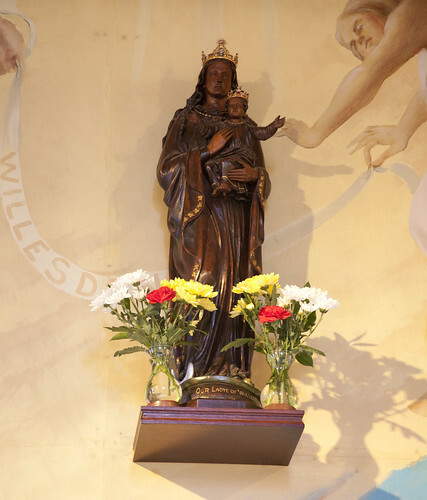 They didn't teach him that the Dogma of the Immaculate Conception had been defined in 1854? 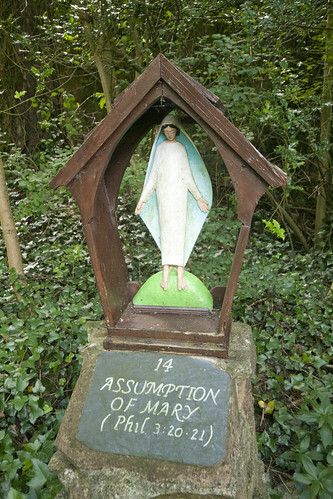 Or the Dogma of the Assumption of Our Lady in 1950? Or has the old chap's memory of those far-off days become a little hazy? Not that these developments were incompatible with the teaching of the Council of Trent. Like Trent itself, they represent an unfolding of the implications of the Deposit of Faith given to the Church by Christ. 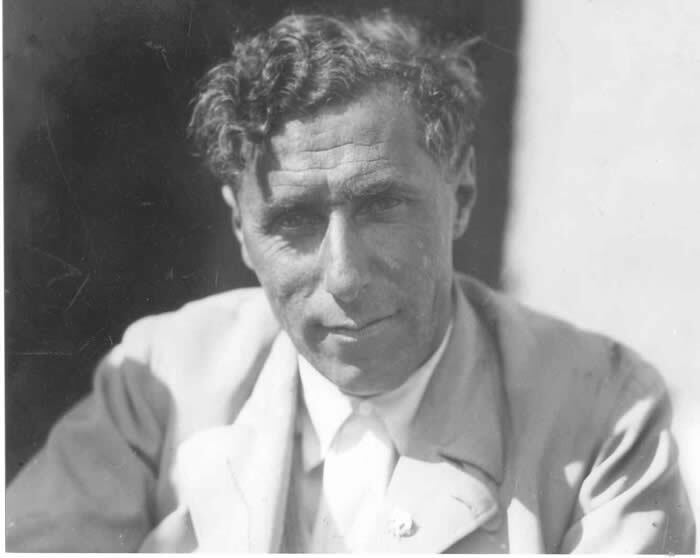 This was real 'progress': not like the kind of 'progress' proposed by the hero of this article, the modernist von Hugel. Watch out, Loftus! von Hugel, perhaps unlike you, accepted the condemnation of modernism by Pius X, and in his twilight years scandalised his modernist friends by his devotion to the Rosary. Loftus' readers should pray that something similar happen to him. But come back tomorrow and I'll have something to say about Loftus' very interesting attitude to the doctrine of the Resurrection of Our Lord. And what opinions might those be? Opinions critical of Mgr Basil Loftus, for example? Does that mean that there aren't going to be more underhand attempts to silence his critics? 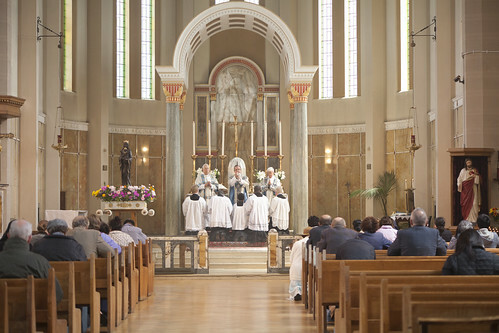 No more shouting down the phone, as Fr Ray Blake experienced? No more legal bullying, as Fr Michael Clifton experienced? I've already had a pretty interesting time with letters from the Monsignor. His attitude seems to be: if you've lost the argument, silence your opponent. Inexorably the Church is now going to have to revisit the vexed question of what constitutes sin. 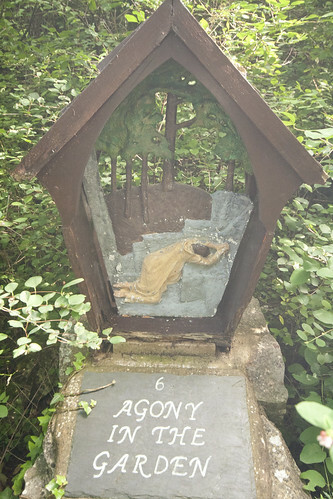 In the classical moral theology position sin is committed when the moral law is broken. From that moment, and by that act alone, sin becomes 'ontic'--in other words, it "exists". 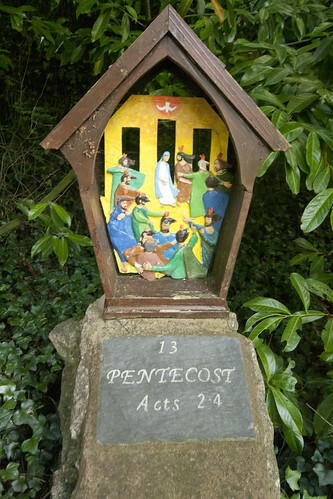 [It has to exist, of course, to be matter for the Sacrament of Confession: something Loftus seems to have forgotten.] All that can then be done is to seek some form of mitigation--through imperfect knowledge, lack of full consent to the 'sinful' act, or overall lack of mature judgement in general. This illustrates Mgr Loftus' favourite trick, of leaving it just a little unclear whether he is giving his own views or talking about other people's. But looking at the ideas which he is, let us say, 'exploring', we are faced with an even bigger ambiguity. On the face of it he could be making a very simple point which can, in fact, be expressed within the 'classical' position: those who genuinely believe they are not sinning are clearly not committing mortal sin, and we can further say that their sin, while 'objective', is not 'subjective'. Subjectively speaking, what they did was not a sin. Of course this raises the question of how far the 'erring conscience' can extend, given that the Natural Law cannot be erased from our hearts. The Nazis who seemed so convinced that killing Jews was morally good won't get off that easily. The corruption of their consciences which led to those beliefs must have been at least partially their responsibility, and the humanity of their victims is not something which they could ever completely forget. But unless you are determined to force the sense of Loftus' words into the straitjacket of orthodoxy, the tendency of this passage appears to be much more radical. The suggestion seems to be that whatever the 'People of God', or even just 'the individual', decides is the right thing, just is, ipso facto, the right thing. The contrast between (subjective) sin and the 'moral law' seems to disappear at a certain point, and instead we find him talking about the individual's judgement of the precise circumstances of the case, and a grown up 'taking responsibility'. If you look at the circumstances of the case, and come to a conclusion (killing is usually wrong, but maybe we can make an exception for Jews), then the suggestion seems to be that you are actually infallible, at least if there is a group of you and you can parade yourself as the 'People of God' (or should that be, the Volk?). I use an extreme example - Nazi anti-semitism - to test the implications of Loftus' ramblings, because it is typical of theological liberals and philosophical subjectivists to focus exclusively, when talking about how people should be allowed to do whatever they like, on a narrow range of examples which they have themselves already decided that people should be allowed to do: say, use contraception, or divorce and remarry. But if contraception is to be allowed for no reason other than that people are tempted to use it, then what of the kinds of wrongdoing that even liberals still reject? What Loftus is doing here is fundamentally dishonest. First, by refusing to make clear whether he is talking, at different points, about objective or subjective wrongdoing. Second, by refusing to make clear whether he endorses the position he discusses. And third, by presenting in plausible terms a view which is absolutely toxic: that it is 'childish' to take the objective moral law seriously, and that somehow the Holy Spirit guarantees that what people convince themselves is right, is right. This won't do, Monsignor. It's not big and it's not clever. And it's not new either: not even your antiquated theological exemplars, Fuchs and Brady, thought it up, the precursors of this rubbish belong in the 19th century or even earlier. Loftus' inability to name a theologian under 80 who agrees with him is, perhaps, the ray of hope which shines through the article despite all his best efforts. The Church may be going through a Passion in imitation of her Lord's, but we have the promise of the Resurrection. Fr Armand de Malleray FSSP had a letter published in the Catholic Herald the other week which I think deserves a permanent place on the internet, so I reproduce it below. It is a very beautiful brief explanation of the value of celibacy, and it demonstrates what would be perfectly possible to have, in our Catholic press, if the various papers thought it appropriate to have as columnists articulate writers with a traditional formation, rather than fill about 80% of their comment space with a rag-bag of C-list celebrities and self-promoting dissidents. Fr Rolheiser is perhaps the most annoying columnist in the UK Catholic press after Mgr Loftus. Admittedly there is stiff competition from Quentin de la Bedoyere (pet topic: the falsity of Humanae Vitae), also in the Catholic Herald, and Robert Mickens of The Tablet, and some of the columnists in the Universe are just so boring I can't claim to have formed a judgement about them. 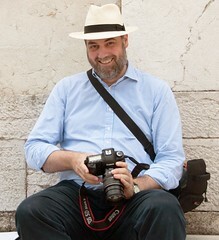 Rolheiser has the distinction of writing a 'syndicated' column, which means that it appears simultaneously in publications all over the English-speaking world, which is nice for him. 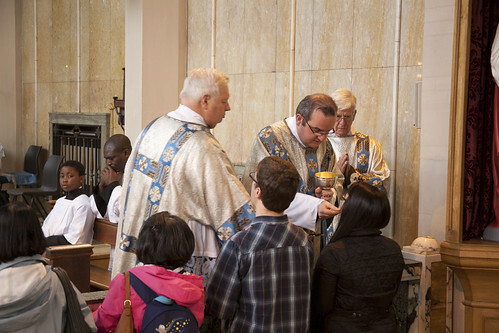 The most scandalous of his columns are those, which appear once a year, in which he plays down the teaching of the Church on suicide, something which is not just offensive to pious ears but actually dangerous, particularly for young people who may be tempted towards that terrible sin. Being an accessory (in the sense used in moral theology) to suicide isn't something I'd want on my conscience, but Fr Rolheiser seems to be made of sterner stuff. Here's a nice fisk of him writing on ecumenism. I wonder if it is significant that the Catholic Herald uses, for its byline photo of him, one in which he's wearing a clerical collar; all the others I can find have him in civvies. The fact that Fr Rolheiser starts his reflections on celibacy with a quotation from Thomas Merton, who famously broke his own vow of celibacy, should ring a few warning bells. Rolheiser doesn't burden his readers with that contextual information. You can read the article to which Fr de Malleray is replying here. Last week Fr Rolheiser endorsed Thomas Merton's unfortunate option that 'celibacy is abnormal and dooms you to live in a state not willed by the Creator'. But Thomas Merton confessed in his Journals that he had not kept his solemn vow of chastity. Perhaps more eloquent witness could be quoted to display the value and beauty of so deeply Catholic an institution as consecrated celibacy. 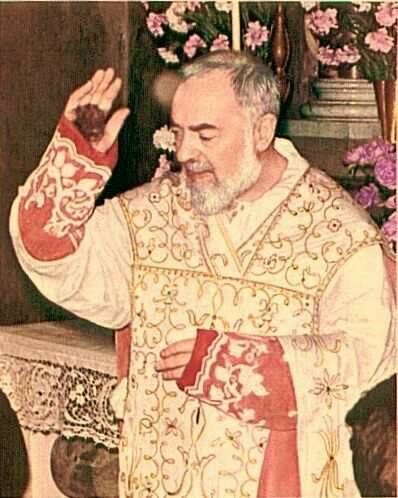 I would suggest that St Padre Pio, St Catherine of Siena, the Holy Curé of Ars, St Thérèse of Liseux, St Maximilian Kolbe, to name but a few among hundreds of thousands of unmarried saints, answered their called to celibacy without illusions but with a filial trust, relying on the greater love of the One to Whom they offered up the sacrifice of matrimonial intimacy and of biological parenthood. more confidently into God's arms and to devote themselves more compassionately to the service of others. And soon enough they would be comforted by the One Who promised: 'And every one that hath left house, or brethren, or sisters, or father, or mother, or wife, or children, or lands for my name's sake, shall receive an hundredfold, and shall possess life everlasting' (Matt 19:29). Therefore, affirming that 'celibacy does condemn you to live in a loneliness that God himself condemned' is fundamentally at odds with Christ's special blessing on consecrated celibates, following Christ's election of that state for his own Self. No one is forced to enter that blessed state and no one should, unless they firmly rely on the actual presence of their Beloved Saviour to fill them daily with everlasting love. But if they do, God's grace will not fail them. 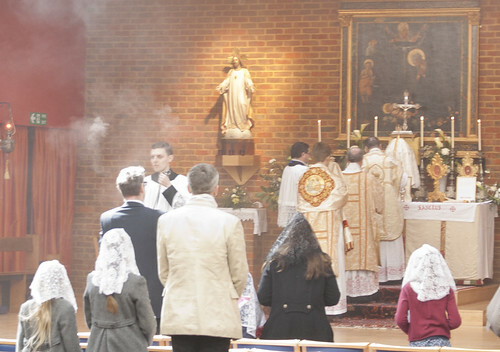 Fr Armand de Malleray FSSP,Reading, Berkshire. This is my annual plug for the open studio of a rather obscure artist, who happens to be my mother. If you are in London this weekend, she is having her 'Open Studio' exhibition on the Chiswick Mall from 11-6 today and tomorrow. Click here for a PDF map to the house. She exhibits in commercial galleries too, this is a chance to see some affordable work in a relaxed domestic setting. This year she has also completed an edition of her mother's letters, complete with her own illustrations: 'A Vicarage in the Blitz'. Molly Rich was the wife of the Chiswick vicar (later Dean of Peterbrough Cathedral, and later still a Catholic convert, Edward Rich), and her war-time letters are a fascinating insight into that period, and also the Anglican milieu of the day. You can buy the book on Amazon (as well as from the Open Studio). Here are a few of the pen-and-ink illustrations, which are also for sale. The illustration below shows the consequences of Molly's attempt to combine the war-time project of keeping hens with civilised vicarage life. There are lots more pictures from the exhibition on the website here.